Socialist Labor Party Hall (1900) | Flickr - Photo Sharing! 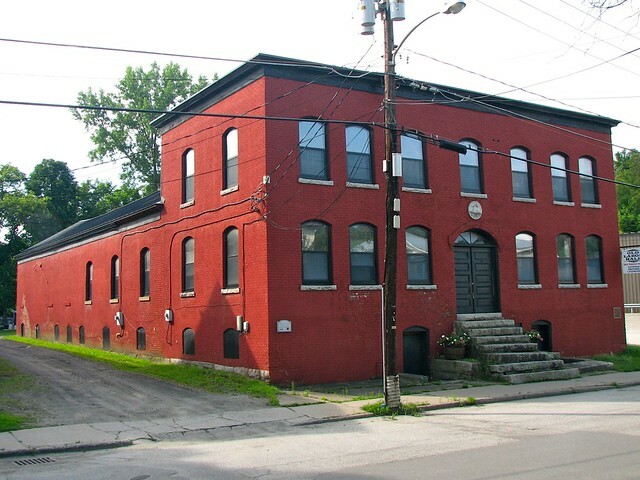 46 Granite Street, Barre, Vermont USA • Located in the former Italian section of Barre, the Socialist Labor Party Hall is a two story flat-roofed brick structure with a gambrel-roofed single story rear hall. It is associated with Barre's rich ethnic heritage, specifically the vital Italian community that immigrated to Barre at the end of the 19th century. The building was constructed in 1900 by volunteers of the Italian community as a meeting hall for the Socialist Labor Party, a political group dedicated to social and labor reform. Its design reflects no particular architectural style, but its form does illustrate the building's function as an assembly hall. The exterior is simply ornamented with Barre granite details. The most important of these is a carved medallion depicting an arm bearing a hammer, the symbol of the Socialist Labor Party, and the initials SLP. – from the National Park Service's Travel Itinerary website. The Socialist Labor Party Hall is significant for its association with socialist and anarchist politics, labor organizations, and Italian immigrant heritage in the early 20th century. Barre, Vermont played a central role in the history of Italian anarchism and militant unionism in the United States, and was the leading place were debates took place among anarchists, socialists, and union leaders over the future direction of the labor movement in America. The Socialist Labor Party Hall, as the primary site for these discussions, embodies the radical heritage and the strength of the union movement during the early 20th century. – from the National Park Service. ☞ On May 16, 2000, the National Park Service designated this structure a National Historic Landmark (#98001267). National Historic Landmarks are nationally significant historic places designated by the Secretary of the Interior because they possess exceptional value or quality in illustrating or interpreting the heritage of the United States. Today, fewer than 2,500 historic places bear this national distinction. [And one of only 17 in Vermont.] Working with citizens throughout the nation, the National Historic Landmarks Program draws upon the expertise of National Park Service staff who work to nominate new landmarks and provide assistance to existing landmarks. ☞ This structure has also been listed on the National Register of Historic Places (#98001267), since 1998. • More info: The GeoHack for 44.198419, -72.507428; and the Wikipedia summary.